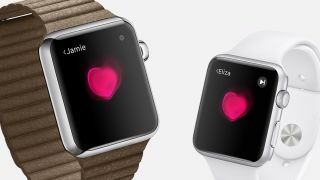 Perhaps the oddest feature of the Apple Watch is its ability to send heartbeats to fellow Apple Watch wearers. Meant for health and fitness tracking, it's still a fun little trick when showing off the wearable, if only for its equally cool and slight creep factor. Until watchOS 2 comes out in the fall, you can't really do much else to demonstrate the watch's uniqueness. There aren't as many apps for the Watch as there are for Android Wear and quite a few have simply been ported over, meaning not every single Watch feature has been properly utilized. In the meantime, the more uncommon features you don't see on other smartwatches are simply Digital Touch which you can use to draw pictures to send to friends, or customizing various detailed Watch faces. That said, if you want to use your watch to send heartbeats, here's how. 1. Press the side button beneath the Digital Crown to open the Friends interface. 2. Once here, select the friend you'd like to send your heartbeat to. Note this only works for people who own an Apple Watch. 3. Tap the Digital Touch icon - it's the little hand under your friend's face on the bottom middle part of the screen. 4. Using two fingers, press the screen. 5. A pink heart-shaped blob will pop up as a representation of your heartbeat. The Watch's haptics will kick in and you'll essentially feel the heart-beat rhythm you're sending off to your friend. 6. Hold the screen down for a longer heartbeat message or move your fingers away for a short heartbeat hello. And there you have it! Now, you can let someone know you're thinking of them from far away, or just weird out your other Apple Watch-wearing friends.